Hello all, I been really stressed out lately due to life stuff happening. Sorry for the lag of new art. However, I do have another analysis for you. 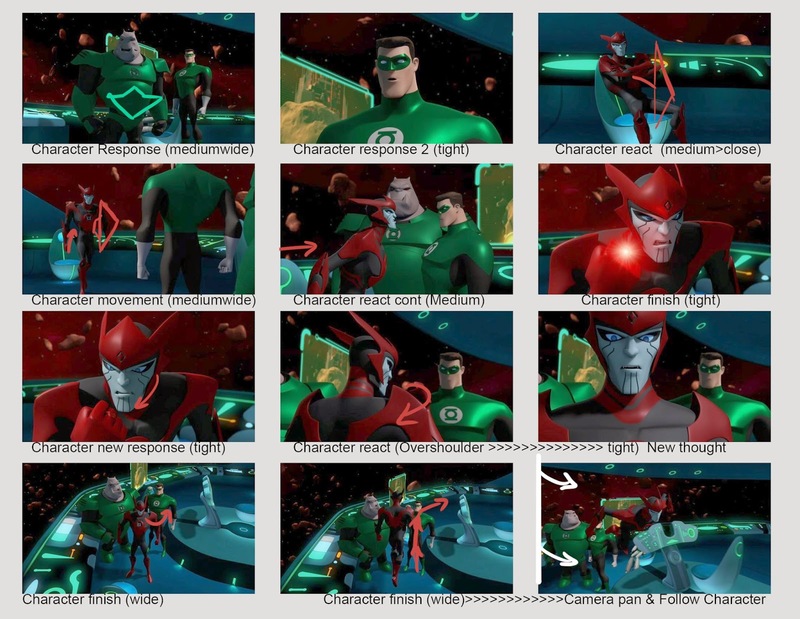 This one is a shot analysis from the Green Lantern TV show. It's just the intro again. 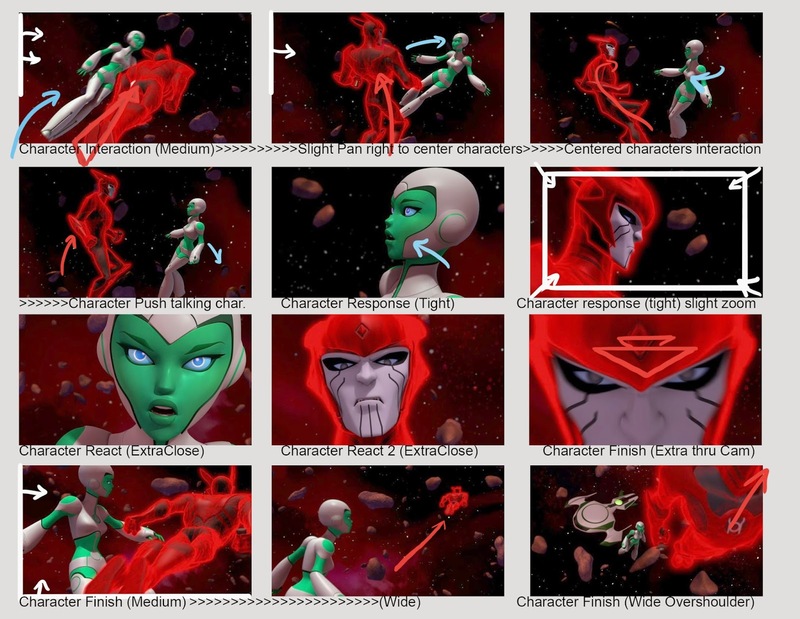 I could do the whole episode… probably won't though. I will probably do the fight scenes though, curious how those work. 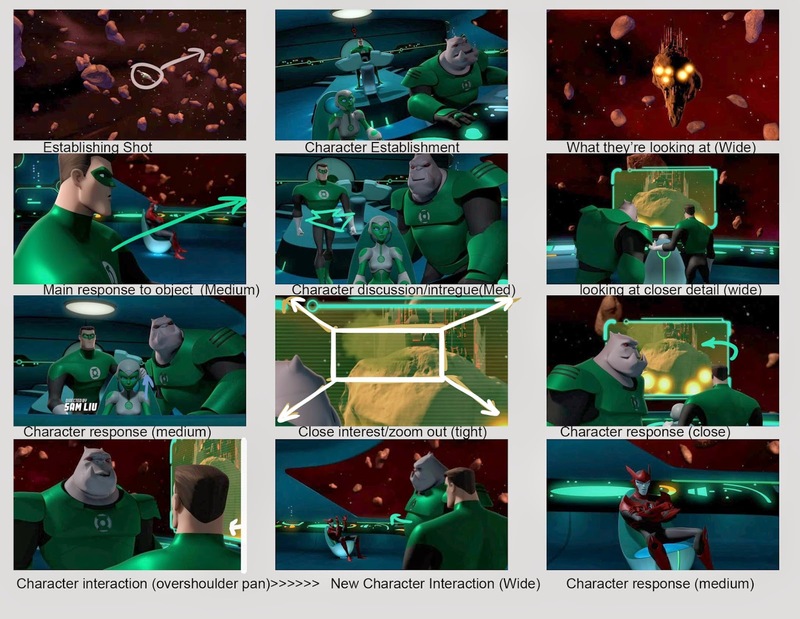 Shot Type Analysis for "Green Lantern"
1. Establishing shots are first, where are we. It's a wide shot, reminding us, "were with the ship in space with the main characters." 2. The next shot is 'where exactly are our characters?' We know previously that the ship is in space, and now we get to see in a wide/ish shot the main characters, except Razer. 4. A double reason for this shot, we get a close up on the MAIN character, Hal, and his reaction as well as his entrance into the 'conversation' that the other 2 closer together characters are having(him exiting the scene to the right and moving towards Killawog and Aya). The SECOND reason is to establish where Razer is, which was off camera previously, showing us his overall disinterest and lack of 'group kinship' with the others. 5. Hal joins the others to continue the conversation, leaving Razer out of shot again. Their vision is continued off camera so we must…. 6. Switch to their vision again! What in particular IS the conversation about? 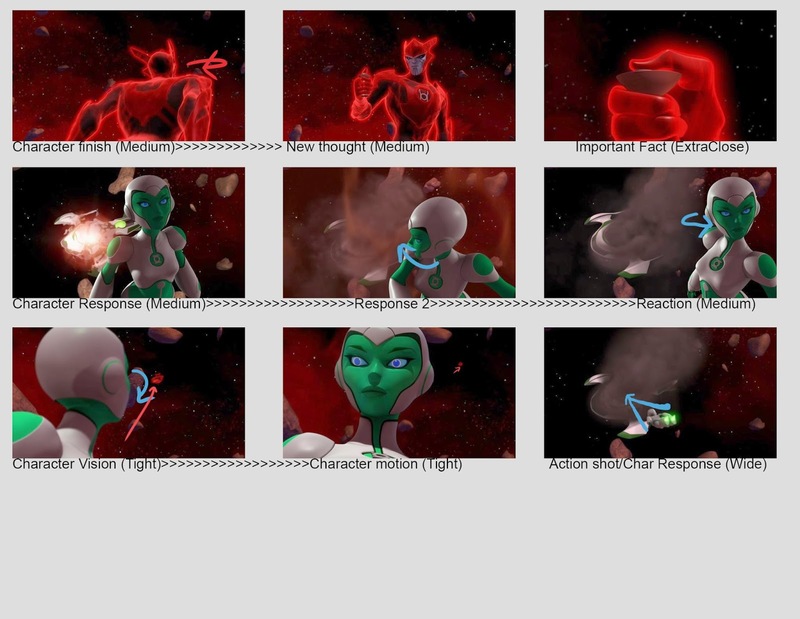 Well, it's about the air lock IN shard, the characters are in the shot, looking over their shoulders this time since Hal is closer to them we can now accomplish seeing them as well as the subject of the conversation. 7. We have more characters response, dialogue of thoughts once more. Aya zooms the camera in on Shard and so we…. 8. See her zoom in on the garbage being released from Shard. It's a slow pan out as the gas and various debris exits. 9. 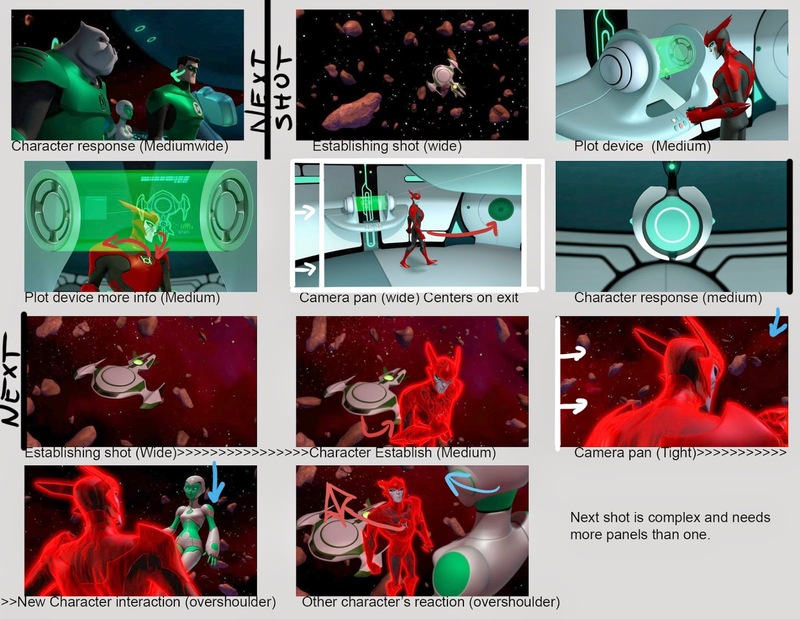 This being Killawog's idea, lets us focus on him and Hal (the captain) finishing the conversation. 11. IF we were to see Hal's response next, we would over the shoulder Killawog in this shot BUT since Razer is the responder, we simply pan as Killawog turns, making an incredible shot. Here's why: The characters that are now in agreement(Killa and Hal) are on the right half of the screen and fill the screen, are close, and Razer is the balance for the other half of the screen, and he is surrounded by distance and space, giving his apathy room to 'sit'. His distanced remark is obvious not only by his vocal tones and his pose, but also by the amount of space that resides around him and his half of the screen. 12. We really want to see that sarcasm, so the next shot is closer in on just him. NOTICE: we don't go into just his face. We still let that space and distance linger around him, Letting us see his expression better than before, but its his demeanor and his posing that really display his total lack of interest and his distain for how stupid everyone is around him. If this shot was tight in, we would loose the distance that he feels in a visible way.